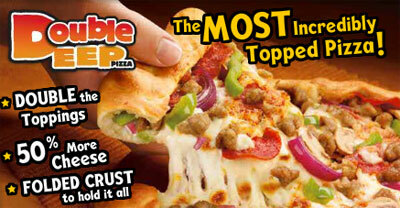 Yes, that's right, a single slice of Pizza Hut's new Double Deep Meat Lover's Pizza has 580 calories! 330 of those calories are from fat. Touted by Pizza Hut as an "innovation," the Double Deep "features so many toppings that Pizza Hut needed to use a specially folded crust to hold them in." Here's the rest of the nutritional stats for a single slice of Pizza Hut's Double Deep Meat Lover's Pizza: 580 calories, 330 calories from fat, 36 grams total fat, 14 grams saturated fat, 1.5 grams trans fat, 100 mg cholesterol, 1990 mg sodium, 31 grams carbs, 2 grams fiber, 3 grams sugars, 31 grams protein. Yum! Brands has teamed up with the Friends of the World Food Program for World Hunger Relief Week. Called "World Hunger Relief Week," the program supports the United Nations World Food Programme, the frontline agency in the fight against global hunger. During October 14-20, 35,000 company and franchised restaurants located in 112 countries will be participating in some way, including KFC, Pizza Hut, Taco Bell, Long John Silver's and A&W All-American Food. The campaign, which will run from October 14th through October 20th, will increase awareness about hunger, engage volunteers, and raise critically needed funds to help WFP serve the world's areas of greatest need. "This unprecedented and innovative campaign brings together the public and private sector to address one of the most pressing issues of our time: the world's hunger crisis," said Friends of WFP President and CEO Karen Sendelback. "Hunger is a global concern and an issue that faces each of us no matter where we live and work. Through World Hunger Relief Week, we can all make a difference to stop world hunger." There's more information and you can donate at the "From Hunger to Hope" web site that Yum! Brands has set up. Sure, Yum! 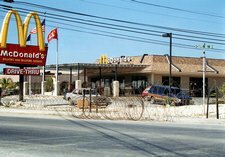 is using a global tragedy to promote their fast food chains, but it is an important concern that needs awareness. 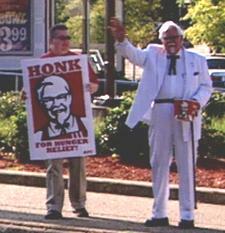 The KFC "Honks for Hunger Relief" Tour begins on the East Coast on Oct. 11. The KFC Colonel will be driving cross-country to raise money for World Hunger Relief Week. Each time the Colonel encounters a motorist who signals support for hunger relief with a honk of the horn, he will add a buck to the KFC bucket. Every honk means another dollar donated by KFC. The Colonel hopes to raise tens of thousands of dollars during his road trip. Also, the From Hunger to Hope blog pointed out in comments to this blog entry that "we're not trying to promote our food in any way with this effort." I'm glad Yum! is doing something to promote awareness about hunger, but I still fail to see how The Colonel driving cross country with signs and a car plastered with KFC logos isn't promoting their food, too.